Public Personnel Management has served as an essential, concise reader for public personnel and human resource management courses in the fields of public administration, political science, and public policy over the last 25 years. Since the first edition published in 1991, the book has offered professors and students alike an in-depth look at cutting-edge developments beyond standard textbook coverage, to provide a broad understanding of the key management and policy issues facing public and nonprofit HRM today. 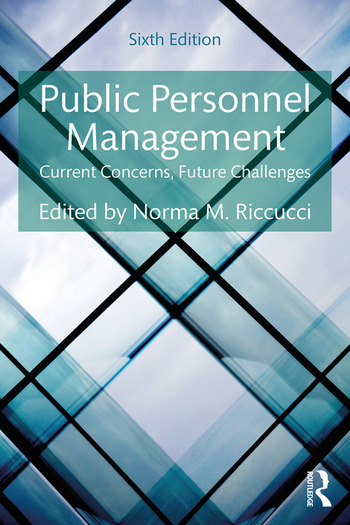 Original chapters are written expressly for the text by leading public administration scholars, each focusing on specific and often controversial concerns for public personnel management, such as pensions, gender and sexuality, healthcare, unions, and a multi-generational workforce. Now in an extensively revised sixth edition, Public Personnel Management presents new, original chapters to examine developments of interest to researchers and practitioners alike, including: remote working, cybersecurity, public service motivation, the abandonment of traditional civil service at the state and local levels, the Affordable Care Act and its implications for practice, pension systems and labor relations, affirmative action, social equity, legislation surrounding LGBT rights, and – as the field of public personnel management becomes more internationalized – a chapter addressing public personnel management across Europe. This careful and thoughtful overhaul will ensure that Public Personnel Management remains a field-defining book for the next 25 years. 9. Public Employees’ Liability for "Constitutional Torts"